Stanley Allen McChrystal (born August 14, 1954) is a retired United States Army four-star general best known for his command of Joint Special Operations Command (JSOC) in the mid-2000s. His last assignment was as Commander, International Security Assistance Force (ISAF) and Commander, U.S. Forces - Afghanistan (USFOR-A). He previously served as Director, Joint Staff from August 2008 to June 2009 and as Commander of JSOC from 2003 to 2008, where he was credited with the death of Abu Musab al-Zarqawi, leader of Al-Qaeda in Iraq, but also criticized for his alleged role in the cover-up of the Pat Tillman friendly fire incident. McChrystal was reportedly known for saying what other military leaders were thinking but were afraid to say; this was one of the reasons cited for his appointment to lead all forces in Afghanistan and also the reason he was later relieved of that command. He held the post from June 15, 2009 to June 23, 2010. Former Defense Secretary Robert Gates described McChrystal as "perhaps the finest warrior and leader of men in combat I ever met." But following unflattering remarks about Vice President Joe Biden and other administration officials attributed to McChrystal and his aides in a Rolling Stone article, McChrystal was recalled to Washington, D.C., where President Barack Obama accepted his resignation as commander in Afghanistan. His command of the International Security Assistance Force in Afghanistan was assumed by the deputy commander, British Army General Sir Nicholas Parker, pending the confirmation of a replacement. Obama named General David Petraeus as McChrystal's replacement; Petraeus was confirmed by the Senate and officially assumed command on June 30. Days after being relieved of his duties in Afghanistan, McChrystal announced his retirement. Since 2010, he has taught courses in international relations at Yale University as a Senior Fellow of the University's Jackson Institute for Global Affairs. McChrystal graduated high school from St. John's College High School in Washington, DC. He graduated from the United States Military Academy at West Point, New York, in 1976 and was commissioned a second lieutenant in the United States Army. His initial assignment was to C Company, 1st Battalion, 504th Parachute Infantry Regiment, 82nd Airborne Division, serving as weapons platoon leader from November 1976 to February 1978, as rifle platoon leader from February 1978 to July 1978, and as executive officer from July 1978 to November 1978. In November 1978, McChrystal enrolled as a student in the Special Forces Officer Course at the Special Forces School at Fort Bragg, North Carolina. Upon completing the course in April 1979, he remained at Fort Bragg as commander of Operational Detachment—Alpha 714 (an "A-team") in A Company, 1st Battalion, 7th Special Forces Group (Airborne). This was not the last time that '714' would be associated with McChrystal. In June 1980, he attended the Infantry Officer Advanced Course at the Infantry School at Fort Benning, Georgia, until February 1981. In February 1981, McChrystal moved to South Korea as intelligence and operations officer (S-2/S-3) for the United Nations Command Support Group—Joint Security Area. He reported to Fort Stewart, Georgia, in March 1982 to serve as training officer in the Directorate of Plans and Training, A Company, Headquarters Command. He moved to 3rd Battalion, 19th Infantry, 24th Infantry Division (Mechanized), in November 1982, where he commanded A Company before becoming battalion operations officer (S-3) in September 1984. McChrystal moved to 3rd Battalion, 75th Ranger Regiment, as battalion liaison officer in September 1985, became commander of A Company in January 1986, served again as battalion liaison officer in May 1987, and finally became battalion operations officer (S-3) in April 1988, before reporting to the Naval War College in Newport, Rhode Island, as a student in the Command and General Staff Course in June 1989. It was during this time that McChrystal also completed a Master of Science degree in international relations from Salve Regina University. After completing the course in June 1990, he was assigned as Army Special Operations action officer, J-3, Joint Special Operations Command until April 1993, in which capacity he deployed to Saudi Arabia for Operations Desert Shield and Desert Storm. From April 1993 to November 1994, McChrystal commanded the 2nd Battalion, 504th Parachute Infantry Regiment, 82nd Airborne Division. He then commanded the 2nd Battalion, 75th Ranger Regiment, from November 1994 to June 1996. During this time he initiated what would become a complete revamping of the existing Army hand-to-hand combat curricula. After a year as a senior service college fellow at the John F. Kennedy School of Government at Harvard University, he moved up to command the entire 75th Ranger Regiment from June 1997 to August 1999, then spent another year as a military fellow at the Council on Foreign Relations. 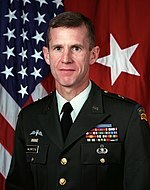 McChrystal as a brigadier general. Promoted to brigadier general on January 1, 2001, he served as assistant division commander (operations) of the 82nd Airborne Division from June 2000 to June 2001, including duty as Commander, United States Army Central (dubbed "Coalition/Joint Task Force Kuwait") in Camp Doha, Kuwait. From June 2001 to July 2002 he was chief of staff of XVIII Airborne Corps, including duty as chief of staff of Combined Joint Task Force 180, the headquarters formation contributed by XVIII Airborne Corps to direct all Operation Enduring Freedom operations in Afghanistan. At the beginning of the Iraq War in March 2003, he was serving in the Pentagon as a member of the Joint Staff, where he had been vice director of operations, J-3, since July 2002. McChrystal was selected to deliver nationally televised Pentagon briefings on U.S. military operations in Iraq, including one in April 2003 shortly after the fall of Baghdad in which he announced, "I would anticipate that the major combat engagements are over." McChrystal at the Pentagon in April 2003, giving a briefing regarding the Iraq War. He commanded the Joint Special Operations Command (JSOC) for five years, serving first as Commanding General, Joint Special Operations Command, from September 2003 to February 2006, and then as Commander, Joint Special Operations Command/Commander, Joint Special Operations Command Forward, from February 2006 to August 2008. He took command of JSOC on October 6, 2003. This position he describes as commander of Task Force 714 in his autobiography, a force which has been identified as the JSOC high-value targets task force. Nominally assigned to Fort Bragg, North Carolina, he spent most of his time in Afghanistan, at U.S. Central Command's forward headquarters in Qatar, and in Iraq. In Iraq, he personally directed special operations, where his work there is viewed as "pivotal". Early successes included the capture by JSOC forces of Saddam Hussein in December 2003. He was promoted to lieutenant general on February 16, 2006. As head of what Newsweek termed "the most secretive force in the U.S. military", McChrystal maintained a very low profile until June 2006, when his forces were responsible for the death of Abu Musab al-Zarqawi, leader of Al-Qaeda in Iraq. After McChrystal's team successfully located Zarqawi and called in the airstrike that killed him, McChrystal accompanied his men to the bombed-out hut near Baqubah to personally identify the body. McChrystal's Zarqawi unit, Task Force 6-26, became well known for its interrogation methods, particularly at Camp Nama, where it was accused of abusing detainees. After the Abu Ghraib torture and prisoner abuse scandal became public in April 2004, 34 members of the task force were disciplined. McChrystal later said that, "we found that nearly every first-time jihadist claimed Abu Ghraib had first jolted him into action." He also said that, "mistreating detainees would discredit us. ... The pictures [from] Abu Ghraib represented a setback for America's efforts in Iraq. Simultaneously undermining U.S. domestic confidence in the way in which America was operating, and creating or reinforcing negative perceptions worldwide of American values, it fueled violence". McChrystal was also criticized for his role in the aftermath of the 2004 death by friendly fire of Ranger and former professional football player Pat Tillman. Within a day of Tillman's death, McChrystal was notified that Tillman was a victim of friendly fire. Shortly thereafter, McChrystal was put in charge of paperwork to award Tillman a posthumous Silver Star for valor. On April 28, 2004, six days after Tillman's death, McChrystal approved a final draft of the Silver Star recommendation and submitted it to the acting Secretary of the Army, even though the medal recommendation deliberately omitted any mention of friendly fire, included the phrase "in the line of devastating enemy fire", and was accompanied by fabricated witness statements. On April 29, McChrystal sent an urgent memo warning White House speechwriters not to quote the medal recommendation in any statements they wrote for President Bush because it "might cause public embarrassment if the circumstances of Corporal Tillman's death become public." McChrystal was one of the first to caution restraint in public statements, until the investigation was complete. McChrystal was one of eight officers recommended for discipline by a subsequent Pentagon investigation but the Army declined to take action against him. According to Pulitzer Prize-winning Washington Post reporter Bob Woodward, beginning in late spring 2007 JSOC and CIA Special Activities Division teams launched a new series of highly effective covert operations that coincided with the Iraq War troop surge of 2007. They did this by killing or capturing many of the key al-Qa'ida leaders in Iraq. In a CBS 60 Minutes interview, Woodward described a new special operations capability that allowed for this success, noting that it was developed by the joint teams of CIA and JSOC. Several senior U.S. officials stated that the "joint efforts of JSOC and CIA paramilitary units were the most significant contributor to the defeat of al-Qa'ida in Iraq." Journalist Peter Bergen also credits McChrystal with transforming and modernizing JSOC into a "force of unprecedented agility and lethality," playing a key factor in the success of JSOC efforts in subsequent years and in the success of the war in Iraq. 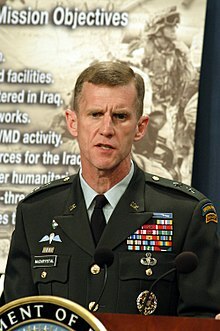 McChrystal was considered a candidate to succeed General Bryan D. Brown as commander of U.S. Special Operations Command in 2007, and to succeed General David Petraeus as commanding general of Multi-National Force – Iraq or Admiral William J. Fallon as commander of U.S. Central Command in 2008, all four-star positions. Instead, McChrystal was nominated by George W. Bush to succeed Lieutenant General Walter L. Sharp as director of the Joint Staff in February 2008, another three-star position. President Obama and McChrystal in the Oval Office in May 2009. With his June 10, 2009, Senate approval to take command in Afghanistan, McChrystal was promoted to General. Shortly after McChrystal assumed command of NATO operations, Operation Khanjar commenced, marking the largest offensive operation and the beginning of the deadliest combat month for NATO forces since 2001. McChrystal submitted a 66-page report to Defense Secretary Robert Gates calling for more troops in Afghanistan, saying "We are going to win." That became public on September 20, 2009. McChrystal warned that the war in Afghanistan might be lost if more troops were not sent, but the report ends on a note of cautious optimism: "While the situation is serious, success is still achievable." In 2009, McChrystal publicly suggested between 30,000 and 40,000 more troops were needed in Afghanistan, as the lowest risk option out of a number of possible troop level changes. He was advised by White House Staff not to present troop increases numbers to "defeat the Taliban", but to "degrade" them. Scott Ritter, former Chief UN Weapons Inspector in Iraq, stated at the time that McChrystal should be fired for insubordination for disclosing information that he should have said only in private to the President of the United States. New York Magazine refers to the leaked report as the "McChrystal risk" as it boxed Obama into a corner about boosting troop levels in Afghanistan. In an article written by freelance journalist Michael Hastings, ("The Runaway General", appearing in Rolling Stone magazine, July 8–22, 2010 issue), McChrystal and his staff mocked civilian government officials, including Joe Biden, National Security Advisor James L. Jones, US Ambassador to Afghanistan Karl W. Eikenberry, and Special Representative for Afghanistan and Pakistan Richard Holbrooke. McChrystal was not quoted as being directly critical of the president or the president's policies, but several comments from his aides in the article reflected their perception of McChrystal's disappointment with President Obama on their first two occasions of meeting. According to Rolling Stone, McChrystal's staff was contacted prior to release of the article and did not deny the validity of the article, although senior members of his staff dispute this, and have accused Hastings in Army Times of exaggerating the seniority of aides quoted and breaking the off the record trust of private conversations between him and the aides. Hastings told Newsweek that he was quite clearly a reporter gathering material, and actually bemused at the degree to which soldiers freely spoke to him. I extend my sincerest apology for this profile. It was a mistake reflecting poor judgment and should never have happened. Throughout my career, I have lived by the principles of personal honor and professional integrity. What is reflected in this article falls far short of that standard. I have enormous respect and admiration for President Obama and his national security team, and for the civilian leaders and troops fighting this war and I remain committed to ensuring its successful outcome. Biden's call to President Obama to tell him of the apology prompted President Obama to request a copy of the profile and then to summon McChrystal to attend in person the president's monthly security team meeting at the White House in lieu of attending via secure video teleconference. During a meeting with President Obama on June 23, two days before the article was released to newsstands and only one day after it was released online, McChrystal tendered his resignation, which the president accepted. Shortly thereafter, President Obama nominated General David Petraeus to replace McChrystal in his role as top commander in Afghanistan. Obama's statement on the topic began as follows: "Today I accepted Gen. Stanley McChrystal's resignation as commander of the International Security Assistance Force in Afghanistan. I did so with considerable regret, but also with certainty that it is the right thing for our mission in Afghanistan, for our military and for our country." This morning the president accepted my resignation as Commander of U.S. and NATO Coalition Forces in Afghanistan. I strongly support the president's strategy in Afghanistan and am deeply committed to our coalition forces, our partner nations, and the Afghan people. It was out of respect for this commitment—and a desire to see the mission succeed—that I tendered my resignation. It has been my privilege and honor to lead our nation's finest. Gates decorates McChrystal with the Defense Distinguished Service Medal at his retirement ceremony on July 23, 2010. Shortly after his removal from command in Afghanistan, McChrystal announced that he would retire from the Army. The day after the announcement, the White House announced that he would retain his four-star rank in retirement, although law generally requires a four-star officer to hold his rank for three years in order to retain it in retirement. His retirement ceremony was held on July 23, 2010, at Fort McNair in Washington D.C. During this ceremony, McChrystal was awarded the Distinguished Service Medal by Army Chief of Staff Gen. George Casey and the Defense Distinguished Service Medal by Secretary of Defense Robert Gates. Hastings and Eric Bates, executive editor of Rolling Stone, repeatedly defended the accuracy of Hastings' article. An inquiry by the Defense Department inspector general found no evidence of wrongdoing by McChrystal or his military and civilian associates. The Pentagon report also challenged the accuracy of Hastings' article, disputing key incidents or comments reported in it. The report from the inquiry states: "In some instances, we found no witness who acknowledged making or hearing the comments as reported. In other instances, we confirmed that the general substance of an incident at issue occurred, but not in the exact context described in the article." In response, Rolling Stone stated that "the report by the Pentagon's inspector general offers no credible source—or indeed, any named source—contradicting the facts as reported in our story." After the report was made public, the White House tapped McChrystal to head a new advisory board to support military families, an initiative led by First Lady Michelle Obama and Jill Biden, wife of the vice president. The selection of McChrystal was announced on April 12, four days after the inspector general's report was finished. In 2010, after leaving the Army, McChrystal joined Yale University as a Jackson Institute for Global Affairs senior fellow. He teaches a course entitled "Leadership", a graduate-level seminar with some spots reserved for undergraduates. The course received 250 applications for 20 spots in 2011 and was taught for a third time in 2013. In November 2010, JetBlue Airways announced that McChrystal would join its board of directors. On February 16, 2011, Navistar International announced that McChrystal would join its board of directors. McChrystal is Chairman of the Board of Siemens Government Technologies, and is on the strategic advisory board of Knowledge International, a licensed arms dealer whose parent company is EAI, a business "very close" to the United Arab Emirates government. He co-founded and is a partner at the McChrystal Group LLC, an Alexandria, Virginia-based consulting firm. His philosophy of leadership and building stronger organizations is quoted in the bestselling book by Daniel Levitin The Organized Mind. In 2011, McChrystal joined Spirit of America, a 501(c)(3) organization that supports the safety and success of Americans serving abroad and the local people and partners they seek to help, as an Advisory Board Member. In 2011, McChrystal advocated instituting a national service program in the United States. He stated, "'Service member' should not apply only to those in uniform, but to us all ... America is falling short in endeavors that occur far away from any battlefield: education, science, politics, the environment, and cultivating leadership, among others. Without a sustained focus on these foundations of our society, America's long-term security and prosperity are at risk." McChrystal's memoir, My Share of the Task, published by Portfolio of the Penguin Group, was released on January 7, 2013. The autobiography had been scheduled to be released in November 2012, but was delayed due to security clearance approvals required from the Department of Defense. Portfolio publishers stated, "We have decided to delay the publication date of General McChrystal's book, My Share of the Task, as the book continues to undergo a security review by the Department of Defense ... General McChrystal has spent 22 months working closely with military officials to make sure he follows all the rules for writing about the armed forces, including special operations." On January 8, 2013, McChrystal appeared on MSNBC's Morning Joe program, in which he endorsed stronger U.S. gun control laws, saying that assault weapons were for the battlefield, not schools or streets. He established a consultancy firm, McChrystal Group, in 2011 which uses the slogan "Bringing Lessons from the Battlefield to Boardroom". It includes researchers, practitioners and former military officers. In 2014, McChrystal endorsed Seth Moulton, a Massachusetts Democratic congressional hopeful, attempting to unseat Representative John F. Tierney in the Democratic primary. Having never before made an endorsement, McChrystal said he endorsed Moulton, a Marine veteran, because the United States Congress could benefit from a man of his character. In 2015, McChrystal's second book "Team of Teams" was released and aimed at business organizations and their leaders. With his co-authors, Tantum Collins, David Silverman and Chris Fussell, McChrystal describes how he and his staff remade the Joint Special Operations Task Force in the Middle East to fight a new kind of decentralized, tech-savvy enemy. Fall 2014; Stanley A. McChrystal's townhouse in Alexandria, Va., was where Michael Flynn registered his new company consulting and intelligence business, the Flynn Intel Group. In January 2016, McChrystal became the Chair of the Board of Service Year Alliance — an organization merged from ServiceNation, the Franklin Project at The Aspen Institute, and the Service Year Exchange. Service Year Alliance aims to make a year of full-time service — a service year — a common expectation and opportunity for young Americans of all backgrounds. McChrystal called on the 2016 presidential candidates to embrace practical solutions to restore social trust in the United States "such as engaging young Americans in a year or more of national service." He has also said, "A service year that teaches young Americans the habits of citizenship and the power of working in teams to build trust is one of the most powerful ways this generation can help restore political and civic responsibility—and in the process help to heal a wounded nation." In 2016, FiscalNote announced that McChrystal had joined the company's board of directors. McChrystal is the son of Major General Herbert Joseph McChrystal, Jr. (1924–2013), and his wife, Mary Gardner Bright (died January 2, 1971). His grandfather was US Army Colonel Herbert J. McChrystal Sr. He is the fourth child in a family of five boys and one girl, all of whom would serve in the military or become military spouses. His older brother, Colonel Scott McChrystal, is a retired Army chaplain, and is the endorsing agent for the Assemblies of God. McChrystal married Annie Corcoran, also from a military family, in 1977. The couple have one son. McChrystal is reported to run 7 to 8 miles (11 to 13 km) daily, eat one meal per day, and sleep four hours a night. In May 2017, Netflix released the film War Machine in which Brad Pitt plays a thinly veiled version of McChrystal named McMahon. It was directed by Animal Kingdom's David Michôd and is an adaptation of Michael Hastings' book The Operators. Hastings wrote the Rolling Stone article that revealed the friction between McChrystal's staff and then President Barack Obama's, which ultimately led to McChrystal losing his job. McChrystal, Stanley (2013). My Share of the Task: A Memoir. New York: Portfolio/Penguin. ISBN 9781591844754. OCLC 780480413. McChrystal, Stanley; Collins, Tantum; Silverman, David; Fussell, Chris (2015). Team of Teams: New Rules of Engagement for a Complex World. New York: Portfolio/Penguin. ISBN 9781591847489. OCLC 881094064. McChrystal, Stanley; Eggers, Jeff; Mangone, Jason (2018). Leaders: Myth and Reality. New York: Portfolio/Penguin. ISBN 9780525534372. ^ "Nominations Before the Senate Armed Services Committee, First Session, 111th Congress" (PDF). Retrieved 2012-11-12. ^ Matishak, Martin (28 August 2014). "McChrystal wades into midterm races" – via TheHill.com. ^ Mahaskey, M. Scott (28 July 2017). "Generals Love Him. Top Democrats Despise Him. Can He Be President Anyway?" – via Politico.com. ^ Bumiller, Elisabeth (23 July 2010). "McChrystal Ends Service With Regret and a Laugh" – via NYTimes.com. ^ Elizabeth Bumiller, Mark Mazzetti (2009-05-12). "A General Steps From the Shadows". The New York Times. Retrieved 2009-05-13. ^ LeBlanc, Paul (31 December 2018). "Retired Gen. Stanley McChrystal hits Trump as immoral, dishonest". CNN. Retrieved 31 December 2018. ^ Rajiv Chandrasekaran and Karen DeYoung (June 24, 2010). "With McChrystal out, difficult Afghan mission gets harder". Washington Post. ^ a b c d e f g h i j k "Is This The Man Who Will Get Bin Laden?". The Virginian Pilot. 2009-05-13. pp. A1, A12. ^ Spencer Ackerman (September 15, 2010). "Stan McChrystal Teams Up With Tina Brown To Save America". Wired. ^ "Obama's Afghan War Decision: A Team Of Rivals". NPR.org. Retrieved 2018-12-31. ^ a b The, Guardian (UK) (2009-09-27). "Stanley McChrystal: The president's stealth fighter". London: The Guardian (UK). Retrieved 2009-10-05. ^ a b Sisk, Richard (2014-02-03). "Gates Wanted McChrystal to Fight for His Job". Military.com. Retrieved 2015-04-29. ^ BBC News – Key players in Gen Stanley McChrystal meeting. BBC.co.uk (2010-06-23); retrieved 2011-01-14. ^ a b c d Michael Hastings (July 8–22, 2010). "The Runaway General". Rolling Stone. Retrieved June 24, 2010. ^ a b Wilson, Scott; Shear, Michael D. (June 23, 2010). "Obama relieves McChrystal of his duties; names Petraeus as replacement". The Washington Post. Retrieved June 23, 2010. ^ Cooper, Helene; Shanker, Thom; Filkins, Dexter (June 23, 2010). "Gen. McChrystal Is Relieved of Command". The New York Times. Retrieved June 23, 2010. ^ a b Gearan, Annie (June 28, 2010). "Stanley McChrystal Retiring From The Army After Firing By Obama". The Huffington Post. Retrieved June 30, 2010. ^ "Overview - Yale Jackson Institute for Global Affairs". ^ "Call to Remember". Retrieved September 14, 2018. ^ a b Gal Perl Finkel, A NEW STRATEGY AGAINST ISIS, The Jerusalem Post, March 7, 2017. ^ a b c d e f g h i Joint Staff General/Flag Officer Biographies. "Lieutenant General Stanley A. McChrystal, Director, Joint Staff". Joint Chiefs of Staff. Archived from the original on December 8, 2008. ^ My Share of the Task, 32. ^ "McChrystal ISAF Biography". Archived from the original on 2013-02-17. ^ "75th Ranger Regt. wins team trophy at first All-Army Modern Combatives Championship". U.S. Army Training and Doctrine Command. November 18, 2005. Archived from the original on October 29, 2012. Retrieved January 3, 2013. ^ a b "In hunt for terrorists in Iraq, general is no armchair warrior". The Washington Times. October 2, 2006. ^ Loughlin, Sean (April 14, 2003). "Pentagon: 'Major combat' over, but smaller fights remain". CNN International. ^ My Share of the Task, 93. ^ Haddick, Robert (December 18, 2009). "This Week at War:McChristal Pulls out Old Playbook". ForeignPolicy.com. Washington Post Company. Retrieved January 7, 2013. ^ Kaplan, Robert D. (March 9, 2010). "Man Versus Afghanistan". Atlantic Media Company. Retrieved January 7, 2013. ^ a b Naylor, Sean D. (March 6, 2008). "Wide support for SEAL tapped to lead JSOC". Military Times. Archived from the original on May 16, 2009. ^ M.J. Stephey (May 12, 2009). "Stan McChrystal: The New U.S. Commander in Afghanistan". Time. Retrieved August 26, 2010. ^ Schmitt, Eric; Marshall, Carolyn (March 19, 2006). "In Secret Unit's 'Black Room,' a Grim Portrait of U.S. Abuse". The New York Times. ^ Bowden, Mark (May 2007). "The Ploy". The Atlantic. ^ "Rumors & News Bring Out Old News". Waronterrornews.typepad.com. 2009-05-12. Retrieved 2012-11-12. ^ Lindlaw, Scott; Mendoza, Martha (August 4, 2007). "General Suspected Cause of Tillman Death". Associated Press. ^ Barnes, Julian (July 27, 2007). "General in Tillman case may lose star – The retired officer faces demotion for misleading investigators in the 2004 friendly-fire death of the Army ranger". The Los Angeles Times. p. A-13. ^ Krakauer, Jon (October 14, 2009). "Gen. McChrystal's Credibility Problem". The Daily Beast. ^ "Secret killing program is key in Iraq, Woodward says". CNN. September 9, 2008. Retrieved May 24, 2010. ^ "New U.S. Commander In Afghanistan To Be Tested". NPR. Retrieved 2010-06-24. ^ Bergen, Peter. Manhunt: The Ten-Year Search for Bin Laden From 9/11 to Abbottabad (2012). pp. 152–158 and captions. ^ Lardner, Richard (March 29, 2007). "Socom Leader To Retire; His Deputy Likely Successor". The Tampa Tribune. Archived from the original on May 17, 2009. ^ Gordon, Michael R.; Schmitt, Eric (January 21, 2008). "Pentagon Weighs Top Iraq General as NATO Chief". The New York Times. ^ Klein, Joe (March 5, 2008). "Who Replaces Petraeus?". Time Swampland. ^ "Bush seeks a 'quick study' to replace Central Command chief". USA Today. March 13, 2008. ^ Dreazen, Yochi J. (May 1, 2008). "Lawmakers Hold Up a Top General's Nomination". The Wall Street Journal. ^ McMichael, William (May 25, 2008). "Troop cuts possible in fall, Petraeus says". Army Times. ^ "Washington Post coverage of General McChrystal's 66 page report" (PDF). The Washington Post. Retrieved 2010-06-24. ^ Schmitt, Eric (2009-09-20). "New York Times coverage of McChrystal report". Nytimes.com. Retrieved 2012-11-12. ^ Kimberly Dozier (January 5, 2013). "McChrystal takes blame for magazine article". Army Times. Gannett Government Media Company. The Associated Press. Retrieved January 7, 2013. ^ "Swine Flu Vaccine For Gitmo Detainees? ; Should General McChrystal Be Fired?". CNN.com. November 3, 2009. Retrieved 2010-06-24. ^ New York Magazine, April 18, 2011, p. 36. ^ Michael D. Shear, Ernesto Londoño and Debbi Wilgoren (June 22, 2010). "Obama to meet with McChrystal before making 'any final decisions' on dismissal". The Washington Post. Retrieved June 22, 2010. ^ Mark Urban (June 22, 2010). "What's behind McChrystal Obama 'Rolling Stone' row?". ^ "Obama, McCain, Kerry comment on McChrystal: Roundup on reaction to the Rolling Stone profile of U.S. general". MSNBC. ^ Naylor, Sean D. (July 8, 2010). "Sources: Rolling Stone quotes made by jr. staff". Army Times. Retrieved July 8, 2010. ^ Andrew Bast (2010-06-22). "How Rolling Stone Got Into McChrystal's Inner Circle". Newsweek.com. Retrieved 2012-11-12. ^ David Gura. "On Monday Night, McChrystal Called Vice-President Biden To Apologize For Remarks In Profile". NPR. ^ Peter Spiegel (June 21, 2010). "McChrystal on Defensive for Remarks". Wall Street Journal. ^ Jonathan Weisman (June 23, 2010). "McChrystal Out; Petraeus In". Wall Street Journal. ^ "McChrystal's statement, Obama's remarks on McChrystal's resignation". M.journalnow.com. Retrieved 2012-11-12. ^ Stanley McChrystal. "Statement by General Stanley McChrystal". International Security Assistance Force Afghanistan. ^ O'Keefe, Ed (June 29, 2010). "Stanley McChrystal to retire with four-star rank". The Washington Post. Retrieved June 30, 2010. ^ "McChrystal will retire as four-star general: White House". New York Post. June 29, 2010. ^ New York Post (June 29, 2010). "McChrystal will retire as four-star general: White House"; retrieved 2010-07-04. ^ Bumiller, Elisabeth (2010-07-23). "McChrystal Ends Service With Regret and a Laugh". Nytimes.com. Retrieved 2012-11-12. ^ "Gen. McChrystal's retirement ceremony marked by laughter, regret". Washingtonpost.com. 2010-07-23. Retrieved 2012-11-12. ^ Chris Carroll (April 18, 2011). "Pentagon inquiry into article clears McChrystal and aides". Stars and Stripes. Retrieved January 10, 2013. ^ a b c Thom Shanker (April 18, 2011). "Pentagon Inquiry Into Article Clears McChrystal and Aides". New York Times. Retrieved January 10, 2013. ^ Burns, Robert (2011-04-19). "Pentagon inquiry clears McChrystal of wrongdoing". MSNBC. Retrieved 2012-11-12. ^ "McChrystal to Teach Course at Yale", nytimes.com, August 16, 2010; accessed September 18, 2014. ^ Jane Darby Menton, "Applications for McChrystal seminar open", yaledailynews.com, November 2, 2012; accessed September 18, 2014. ^ Ryan Grim, Stanley McChrystal: Lobby Shop Working With Former General", huffingtonpost.com, May 16, 2011; accessed September 18, 2014. ^ "Fired McChrystal to join airline board". Melbourne: News.theage.com.au. 2010-11-10. Retrieved 2012-11-12. ^ "Ret. Gen. Stanley McChrystal joins Navistar board", bloomberg.com, February 16, 2011; accessed September 18, 2014. ^ Roston, Aram (December 13, 2012). "McChrystal Working for UAE-Owned Arms Brokerage". Defense News. Gannett Government Media. Retrieved 2012-12-13. ^ Kate Ackley, "McChrystal's New Consulting Firm Taps Hill Aides", rollcall.com, January 29, 2011; accessed September 18, 2014. ^ Kate Ackley, "Former Appropriations Aides Launch New Lobby Shop", rollcall.com, May 13, 2011; accessed September 18, 2014. ^ Stanley McChrystal (January 23, 2011). "Step Up For Your Country". Newsweek. Retrieved January 2, 2013. ^ Josh Rogin (July 3, 2012). "McChrystal: Time to bring back the draft". Foreign Policy. Retrieved January 2, 2013. ^ "McChrystal, Petraeus predecessor, releasing memoir", Associated Press, November 14, 2012; accessed September 18, 2014. ^ Thomas E. Ricks (October 3, 2012). "Pentagon to McChrystal: Put a sock in it". Foreign Policy. Retrieved January 2, 2013. ^ "Gen. McChrystal: assault weapons are for battlefields, not schools". January 8, 2013. Retrieved January 8, 2013. ^ "McCrystal Group". McCrystal Group. Retrieved 29 October 2016. ^ "Stan McChrystal Takes Network War To The Corporate Sector". Forbes. 7 August 2016. Retrieved 29 October 2016. ^ Miller, Joshua. "Retired Gen. McChrystal endorses congress hopeful Moulton". www.bostonglobe.com. The Boston Globe. Retrieved August 5, 2014. ^ Confessore, Nicholas. "How Michael Flynn's Disdain for Limits Led to a Legal Quagmire". ^ "About - Service Year". Service Year. ^ Assemblies of God (USA) Official website; retrieved 2011-01-14. ^ Starkey, Jerome (2010-03-30). "Burgers go way of booze as US general Stanley McChrystal bans junk food". TimesOnline. London, UK. Retrieved 2010-03-30. ^ "Biography of General Stanley McChrystal". Council on Foreign Relations. Archived from the original on 2017-03-07. Retrieved 2011-01-14. "Stanley A. McChrystal collected news and commentary". The Guardian. "Stanley A. McChrystal collected news and commentary". The New York Times.